Sage is the classic herb for turkey stuffing, as well as pork sausages, and herbed bread. It is a carminative, aiding in the digestion of heavy meals. If you thought that was sage’s only super power, I’ve got a surprise for you. Sage herb is a rock star when it comes to fighting colds, flu, fevers, and coughs. It is diaphoretic, meaning it pushes heat from the core of your body out to your extremities, causing you to sweat. The funny thing is sweat is what breaks a fever, so it tricks your body into acting like it’s finished with the illness and is ready to begin the healing. Sage herb is an easy to grow, short-lived garden perennial. It is hardy in zones 5 to 9. Here in zone 3, I grow it as an annual, but mulch heavily in the winter, just in case we have a mild winter. I always hope it might just struggle through. So far no luck, though. When planting out nursery plants in the spring, I can usually get two or three cuttings before winter comes. 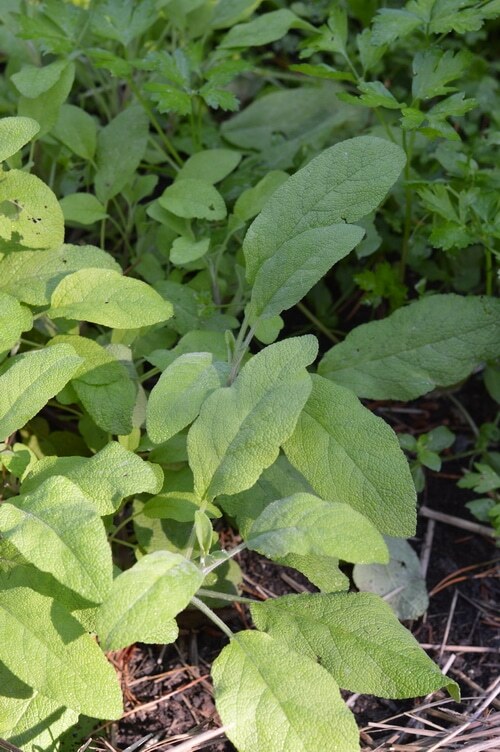 Sage is a Mediterranean plant that likes warm, dry weather. Wait until the soil surface dries before watering sage. It doesn’t like to have wet feet. In zone 5 or higher, sage will flower the second year after planting and you’ll get 3 or 4 years more before it dies back. Plant a new sage plant every third year to ensure a consistent supply. The flowers are very pretty and loved by bees. Sage’s botanical name “Salvia” means “to feel well and healthy, health, heal.” It comes from the Latin “salus” meaning “health, well-being, prosperity or salvation”. “Officinalis” means that this particular herb has had a recognized herbal or medicinal use for centuries. Common names: Common sage, garden sage, golden sage, kitchen sage, and true sage. 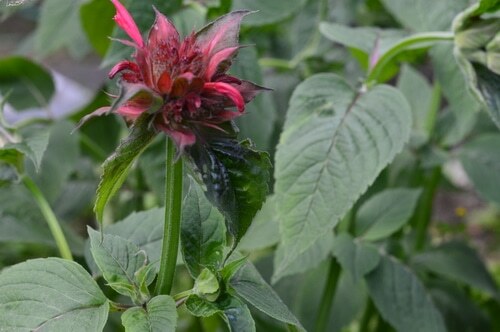 Cultivated varieties include purple, variegated, and red sage. Check your hardiness zones before buying plants. The hardiness zone varies with these selections. Sage is a good choice for a natural remedy for colds and flu. It is soothing to the mucus membranes, relieving sore throat, and coughs while easing feverish conditions. It is also antimicrobial. While oregano is often used as a strong antimicrobial for colds and viruses, sage can be used instead with the same actions. Many years ago I read in Herbs for Farm and Stable by Juliet deBarclay that sage will increase mother’s milk and to feed it to dairy animals to improve milk supply. 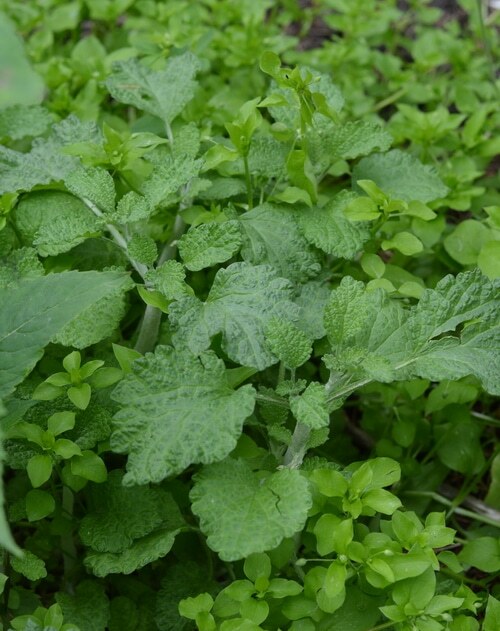 In another herbal, several years later, by David Hoffman, I read that sage will dry up mother’s milk and that nursing mothers should avoid medicinal quantities of sage. Which is true? It turns out that both are actually correct. Sage has different actions on different people. For some mothers, sage acts as a galactogogue, stimulating the production of milk. For other mothers it can dry up the milk supply. If you are a nursing mother, use sage in medicinal quantities with caution, until you understand how you personally react to it. Sage can be enjoyed as a decoction. Take one teaspoon of dried herb in a mug of hot water. Steep it with a cover over the mug to preserve the volatile oils in the liquid. Drink and breathe in the essential oils deeply to loosen lung tightness, ease sore throat, and promote sweating. Enjoy sage in the bath. Stuff a large cloth tea bag full of sage leaves. 2 ounces of fresh leaves or one ounce of dried leaves will fill a 2 x 4 inch muslin bag. (Yes, I weighed them.) Place the bag in a bathtub full of hot water. Let the sage soak in the tub to release the steam. I like to put herbs in a muslin bag when using them in a bathtub. That keeps the bath tub clean and I don’t have to worry about herb bits going down the drain and clogging the pipes. You can stitch them out of old sheeting or fabric scraps, or buy them at Mountain Rose Herbs or Amazon. They aren’t expensive. And they are reusable. When you are feeling awful with a head cold, and you don’t want to move off the couch, having a hot foot bath with sage tea and Dead Sea salts in the water can help. Fill a portable tub or foot bath with hot tap water. Add a handful of Dead Sea salts to the water. Lay a cloth 2 x 4 muslin bag with 2 ounce of fresh sage leaves or 1 ounce of dried sage leaves in the water. Soak your feet for 20 minutes with a warm towel around your shoulders to hold in the warmth. 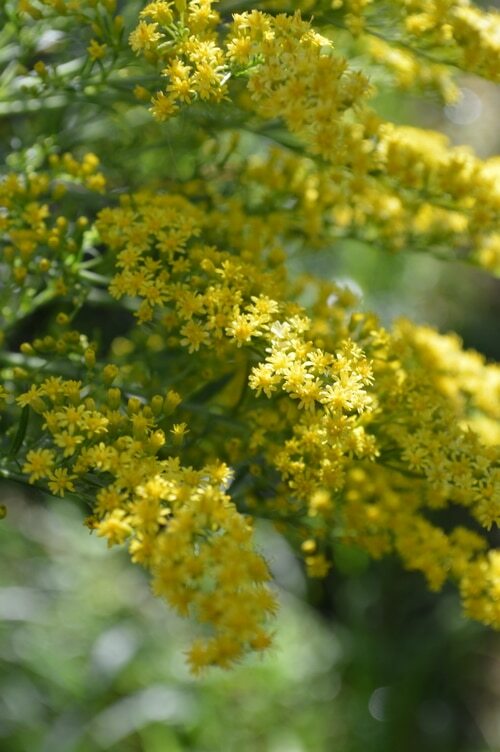 An oxymel is an ancient herbal preparation that combines vinegar, herbs, and honey. “Oxy” means “acidic, sharp, keen, pointed” and “mel” means “honey.” Oxymels make bitter herbs easier to take, like the “spoon full of sugar that helps the medicine go down.” It is considered a specific remedy for lung issues, for colds, and for sore throat. An oxymel is usually made up of 1/3 to ½ honey, ¼ herbs and the remainder vinegar. If you’ve ever made “Fire Cider” before, you’ve probably already made an oxymel. Many folks use raw apple cider vinegar for their oxymels. And there are advantages to that. Raw apple cider vinegar is rich in probiotics which can help the immune system function better. For some oxymels though, I like to use white balsamic vinegar. I like the milder taste of white balsamic over apple cider vinegar. You can use the one you prefer. Pick the sage herb from the garden. Remove any damaged leaves and discard. Allow the sage to wilt for a few hours to overnight. When it is quite limp, chop the sage finely with a sharp knife, including all but the coarsest stems. Set aside. Clean and sanitize a wide mouth quart jar. Place the sage in the jar. Pour 1 cup of honey over the sage. Stir with a spoon to fully mix the sage leaves with the honey. The jar should be about 1/3rd full with the herbs and honey. Heat vinegar in a saucepan until it is just about 110F. Don’t over heat. Warming the vinegar allows it to mix more readily with the honey and herbs already in the jar. Pour the vinegar over the herbs and honey. Stir to fully blend the ingredients. The jar should be full. Place a tight fitting lid on the jar and set aside. Remember to label and date the jar. 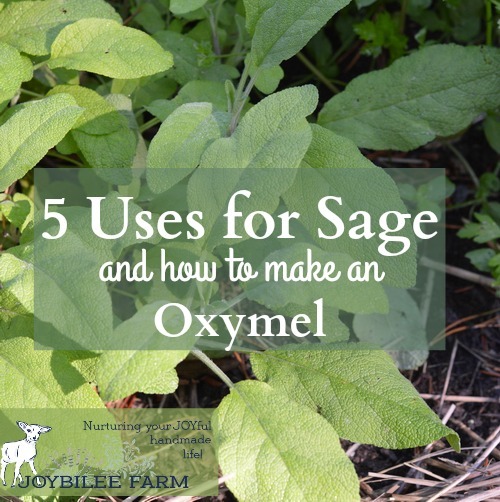 Your sage oxymel is ready in two weeks. But you can leave it for a month or two, allowing the flavours to meld further. When you are ready, heat the jar slightly in warm water to make it free flowing. Strain the herbs out of the oxymel, reserve the liquid. This will keep at room temperature 6 months or refrigerated for up to a year. If you notice any mold, discard it. Both vinegar and honey are preservative. Serve it by the spoonful for sore throat, coughs, colds, fevers, indigestion, or upset. Take as often as needed. I like to mix a spoonful in a cup of hot water and sip it slowly for relief of sore throat and that under-the-weather feeling. When your herb garden is in full production there are so many things you can make with the bounty that go beyond herbal tea. When I was first starting out growing herbs for medicine and not just culinary use, I’d often bundle herbs to dry in August, strip the leaves off the dried stocks in October and put them in jars and forget about them. Come the next August, I’d be dumping jars of herbs out into the goat feeders, while bringing in the new harvest. I might have also bought herbal tea at the store in tea bags because I forgot I had all those jars of dried herbs from the garden. I didn’t know what to do with the abundance. Herbs are such giving, generous plants that you do end up with a lot of dried herbs at the end of the season, even in the harsh realities of zone 3. I have learned over the years so many other ways to use herbs so that the harvest doesn’t go to waste. My friend Kami taught me about herbal baths. At herb school I learned in depth how to grow and harvest different plants and make different kinds of herbal medicine. But if you don’t have the time to devote to the in-depth study of herbs, which I highly recommend if you can carve out the time, I have another suggestion that might help. The DIY Herbal Fellowship is my own membership group where we learn about growing and using herbal remedies one step at a time. The membership facilitates learning about herbs and herbal remedies faster and easier through a monthly focused masterclass that is designed to fit into your already busy life. I love the idea of steeping herbs in the bath water. Mint and coconut oil sounds wonderful! I’m thinking of so many combos I want to try! PLEASE SING ME UP FOR YOUR EMAIL NEWSLETTER BECAUSE YOUR SYSTEM TELLING ME THAT MY EMAIL ADDRESS HAS TO MANY SUBSCRIBE. CAN YOU PLEASE TELL ME WHY. Jethro, I added you to my list. I understand the benefits of horsetail fern but in my area it is seriously invasive. Upon planting Sage I notice the horsetail “sprout-ups” slowed down and those that made it to opening were a bit deformed. When it came time to cut back the Sage I chopped it up fine and laid it down & watered it in to release it’s oils. It had a dramatic effect even into the following year. I continue to add wood char/lime in the fall to keep the soil moving in a more alkaline direction that is unfavorable to horsetail fern.